A visit to Barter Books at Alnwick this week has added 4 books to my TBRs. The Vanishing Point by Val McDermid – a standalone psychological thriller beginning with a nightmare scenario: a parent who loses her child in a bustling international airport. Stephanie Harker is travelling through security at O’Hare airport with five-year-old Jimmy. But in a moment, everything changes. In disbelief, Stephanie watches as a uniformed agent leads her boy away – and she’s stuck the other side of the gates, hysterical with worry. The authorities, unaware of Jimmy’s existence, just see a woman behaving erratically; Stephanie is wrestled to the ground and blasted with a taser gun. By the time she can tell them what has happened, Jimmy is long gone. But as Stephanie tells her story to the FBI, it becomes clear that everything is not as it seems. There are many potential suspects for this abduction. With time rapidly running out, how can Stephanie get him back? A breathtakingly rich and gripping psychological thriller, The Vanishing Point is Val McDermid’s most accomplished standalone novel to date, a work of haunting brilliance. With Our Blessing by Jo Spain – a murder mystery and another book about mothers and babies in the Magdalene Laundries in Ireland, also known as Magdalene asylums. A baby, minutes old, is forcibly taken from its devastated mother. The body of an elderly woman is found in a Dublin public park in the depths of winter. Detective Inspector Tom Reynolds is on the case. He’s convinced the murder is linked to historical events that took place in the notorious Magdalene Laundries. Reynolds and his team follow the trail to an isolated convent in the Irish countryside. But once inside, it becomes disturbingly clear that the killer is amongst them . . . and is determined to exact further vengeance for the sins of the past. The Visitor by Lee Child – a Jack Reacher – I’ve read one of the Jack Reacher books and did enjoy it but looking at the reviews of this book it seems a lot of readers weren’t keen on it whilst many others were. A marmite book, maybe. Sergeant Amy Callan and Lieutenant Caroline Cook have a lot in common. High-flying army career women, both are victims of sexual harassment from their superiors; both are force to resign from the service. And now they’re both dead. Their unmarked bodies are discovered in their homes, naked, in baths filled with army-issue camouflage paint. Expert FBI psychological profilers start to hunt for a serial murderer, a smart guy with a score to settle, a loner, an army man, a ruthless vigilante known to them both. Jack Reacher, a former US military cop, is a smart guy, a loner and a drifter, as tough as they come. He knew both victims. For Agent-in-Charge Nelson Blake and his team, he’s the perfect match. They’re sure only Reacher has the answers to their burning questions: how did these women die? And why? A Foreign Field: a True Story of Love and Betrayal in the Great War by Ben Macintyre – nonfiction – because I’m interested in reading about World War One in both fiction and nonfiction. I enjoyed reading his book Operation Mincemeat so I’m hoping I’ll like this one too. A wartime romance, survival saga and murder mystery set in rural France during the First World War, from the bestselling author of ‘Operation Mincemeat’ and ‘Agent Zig-Zag’. Four young British soldiers find themselves trapped behind enemy lines at the height of the fighting on the Western Front in August 1914. Unable to get back to their units, they shelter in the tiny French village of Villeret, where they are fed, clothed and protected by the villagers, including the local matriarch Madame Dessenne, the baker and his wife. The self-styled leader of the band of fugitives, Private Robert Digby, falls in love with the 20-year-old-daughter of one of his protectors, and in November 1915 she gives birth to a baby girl. The child is just six months old when someone betrays the men to the Germans. They are captured, tried as spies and summarily condemned to death. Using the testimonies of the daughter, the villagers, detailed town hall records and, most movingly, the soldiers’ last letters, Ben Macintyre reconstructs an extraordinary story of love, duplicity and shame – ultimately seeking to discover through decades of village rumour the answer to the question, ‘Who betrayed Private Digby and his men?’ In this new updated edition the mystery is finally solved. Which one would you recommend I read first? This week I’ve chosen the last book I bought just a few days ago. 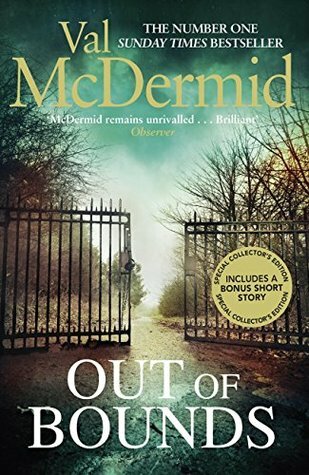 It’s Out of Bounds by Val McDermid, the fourth Karen Pirie book and her 30th novel. ‘Some night, eh. boys?’ Ross Garvie flung a sweaty arm round the neck of Wee Grantie, his best mate in the world. ‘Some night, right enough,’ Wee Grantie slurred. The two youths swung their hips in rough unison to the deep dark bass beat that shuddered through the club. When a teenage joyrider crashes a stolen car and ends up in a coma, a routine DNA test could be the key to unlocking the mystery of a twenty-year-old murder inquiry. Detective Chief Inspector Karen Pirie is an expert at solving the unsolvable. With each cold case closed, justice is served. So, finding the answer should be straightforward, but it’s as twisted as the DNA helix itself. The Karen Pirie books read well as standalone books, but as they continue Karen’s own story I think they are best read in order – and for once I am reading these books in order! I wasn’t sure after I’d read the third book, Skeleton Road that I’d read any more in the series, but this one does tempt me and I like the combination of a cold case linked to a current case. I see that the fifth Karen Pirie book, Broken Ground is to be published on 23 August 2018. 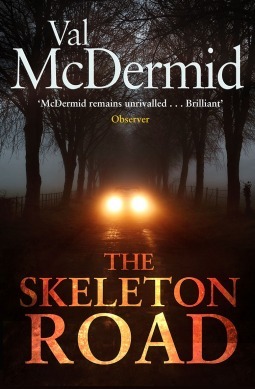 The Skeleton Road by Val McDermid is the third of her DCI Karen Pirie novels. Investigating the identity of the skeleton found, with a bullet hole in its skull, on the rooftop of a crumbling, gothic building in Edinburgh takes Karen and her Historic Cases Unit into a dark world of intrigue and betrayal during the Balkan Wars in the 1990s. It begins slowly, introducing rather a bewildering number of characters one after the other. It moves between the past and the present in Scotland, England and Croatia, told through different viewpoints, and interweaving the sequence of events in the past and the present in a way that I found rather disjointed. Dr River Wilde a forensic anthropologist, discovers that the skeleton is a male, he’d been dead between five and ten years and his dental work shows he was originally from one of the Eastern bloc countries. It’s a complex story with several strands, including the search for war criminals through the work of two lawyers at the International Criminal Tribunal for the former Yugoslavia. Karen’s investigations take her to Oxford and then to a small village in Croatia, a place scarred by fear, where people have endured unspeakable acts of violence. At times I thought I was reading an account of the wars and the search for justice and revenge rather than a murder mystery. Even given the traumatic events it describes I didn’t feel there was much tension in the search for the killer and I was able to figure out who it was fairly quickly. I enjoyed the sections focusing on Karen’s and her assistant DS James, ‘the Mint’ Murray’s detective work, and I liked all the details of her relationship with her partner, Phil (also a police officer, now working on a different team). But I didn’t enjoy this as much as the first two Karen Pirie books – in fact I think the first book, The Distant Echo is by far the best. Every Tuesday Diane at Bibliophile by the Sea hosts First Chapter First Paragraph Tuesday Intros to share the first paragraph sometimes two, of a book that she’s reading or is planning to read soon. This week’s first paragraph is from her third Karen Pirie book, The Skeleton Road by Val McDermid, a book I’m about to read. Fraser Jardine wanted to die. His stomach was knotted tight, his bowels in the twisted grip of panic. A teardrop of sweat trickled down his left temple. The voice in his head sneered at his weakness, just as it had since boyhood. Biting his lip in shame, Fraser forced open the skylight and pushed it outwards. He climbed the last three steps on the ladder one at a time and gingerly emerged on the pitched roof. Never mind that tourists would have paid for this sensational view of a city classified as a World Heritage Site. All Fraser cared about was how far he was from the ground. I can empathise with Fraser – I’ve never liked heights and always get that terrifying feeling that I’m about to fall whenever I climb up to the top of a tall building. When a skeleton is discovered hidden at the top of a crumbling, gothic building in Edinburgh, Detective Chief Inspector Karen Pirie is faced with the unenviable task of identifying the bones. As Karen’s investigation gathers momentum, she is drawn deeper into a dark world of intrigue and betrayal, spanning the dark days of the Balkan Wars. Karen’s search for answers brings her to a small village in Croatia, a place where people have endured unspeakable acts of violence. Meanwhile, someone is taking the law into their own hands in the name of justice and revenge — but when present resentment collides with secrets of the past, the truth is more shocking than anyone could have imagined . . .
I’ve read the first two Karen Pirie books and enjoyed them both, although I think the first one, The Distant Echo, is better than the second, A Darker Domain. This is the second book in Val McDermid’s Kate Pirie series, a series that really should be read in order as A Darker Domain reveals one of the outcomes of the first book, The Distant Echo. Twenty-five years ago, the daughter of the richest man in Scotland and her baby son were kidnapped and held to ransom. But Catriona Grant ended up dead and little Adam’s fate has remained a mystery ever since. When a new clue is discovered in a deserted Tuscan villa – along with grisly evidence of a recent murder – cold case expert DI Karen Pirie is assigned to follow the trail. She’s already working a case from the same year. During the Miners’ Strike of 1984, pit worker Mick Prentice vanished. He was presumed to have broken ranks and fled south with other ‘scabs’… but Karen finds that the reported events of that night don’t add up. Where did he really go? And is there a link to the Grant mystery? The truth is stranger – and far darker – than fiction. The first thing that struck me when I began reading this book is that is not divided into chapters. Instead the text is divided by date and place, which initially is a bit confusing, moving between the two cases Karen is investigating. However, I soon got the hang of it. I like the mix of fact and fiction in A Darker Domain, using the Miners’ Strike as the backdrop to the mystery of Mick Prentice’s disappearance. It is intricately plotted, with a large cast of characters and it’s deceptively easy to read – it’s easy to pass over significant facts that you realise later are of importance. In the tradition of fictional detectives she’s an independent character, who takes little notice of her ineffectual boss, who she nicknames the ‘Macaroon’, undermining his authority. But she is hard-working and tenacious. I like the contrasts Val McDermid portrays, such as the ‘darker domain‘ of the miners’ lives, the rich landowner wanting to find his grandson, and the beautiful setting in Tuscany where the members of a troupe of puppeteers, are squatting in a ruined villa. I also like the mix of the two cases, which, as this is crime fiction, I fully expected would at some point interlink. The question is how do they interlink? Val McDermid has a neat way of leading you along the wrong lines with her twists and turns, culminating in the final paragraph. But the ending seemed rushed, tacked on, almost as an afterthought, which left me bemused and feeling rather flat. So, not as good as The Distant Echo but still an entertaining book. I hope to read the next book in the series, The Skeleton Road, before the end of the year. This week’s first paragraph is from one of the library books I featured in my last post. A Darker Domain by Val McDermid, the second Karen Pirie book. ‘You’ve told her what to do?’ Words tumbling now, tripping over each other, a single stumble of sounds. Val McDermid, creator of TV’s Wire in the Blood, mixes fact with fiction, dealing with one of the most important and symbolic moments in recent history. I’ve only recently become a fan of Val McDermid’s books and wish that I’d started reading them years ago. What do think? Have you read this one or any of her other books? Would you keep on reading? I reserved these books over the last few months and, wouldn’t you know it, they all arrived practically together! 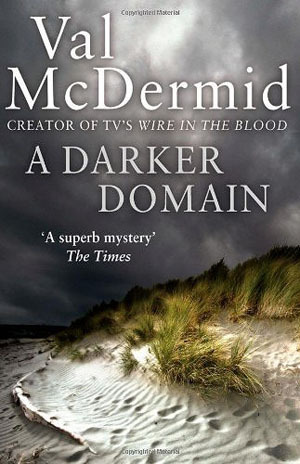 A Darker Domain by Val McDermid. This is the second Karen Pirie book. I’ve borrowed it because I loved the first one, The Distant Echo. In 1984, in Fife, heiress Catriona Maclennan Grant & her baby son are kidnapped. The ransom payoff goes horribly wrong. She is killed while her son disappears without trace. 2008, Tuscany. A jogger stumbles upon dramatic new evidence that re-opens the cold case. For Detective Sergeant Karen Pirie, it’s an opportunity to make her mark. Conclave by Robert Harris – I’ve thoroughly enjoyed other books by Robert Harris, so I’m keen to read this one about how a new Pope is chosen as the cardinals meet in the Sistine chapel to cast their votes. This is a novel and Harris depicts the cardinals as holy men – but ambitious and rivals to become the most powerful spiritual figure on earth. The Hidden Life of Trees:What They Feel, How They Communicate – Discoveries from a Secret World by Peter Wohlleben. I read Katrina’s review of this book and immediately thought it sounded an amazing book as I love trees. Wohlleben is a German forester and his book is about his love of trees and why they matter on a global scale. He makes the case that the forest is a social network – I like the idea that they communicate with each other – even if they don’t actually walk and talk like Tolkien’s ents. Days Without End by Sebastian Barry – I loved his book, The Secret Scripture and am hoping I’ll like this one too. Thomas McNulty and John Coles signed up for the US army in the 1850s and fought in the Indian Wars and then in the American Civil War. The book was awarded the Costa Book Award 2016 and won the 2017 Walter Scott Prize. It was also longlisted for the Man Booker Prize 2017 – not that winning these awards automatically means that I’ll like it and I’m often not keen on books about war.